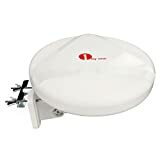 10 Best Omnidirectional TV Antenna (Outdoor & Indoor) - Must Read! 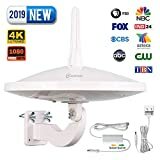 10 Best Omnidirectional TV Antenna (Outdoor & Indoor) – Must Read! Looking to buy the best omnidirectional TV antenna but still confused? Well, you are in the right place. In this post, we have covered the top 10 TV antennas that you can use to watch your favorite channels without a glitch. 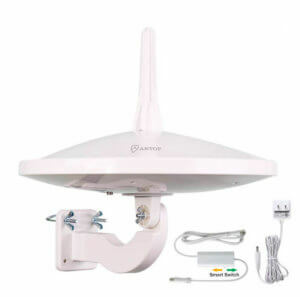 Buyers Guide- How to Choose an Omnidirectional Antenna? TV antennas can be used to watch network television using digital signals over the air. Using an antenna, you can watch your favorite channels without actually subscribing for the same. You can use TV Fool to know what all TV channels are available in your area. Now that you have checked the list, it is time that we dig deep and know the features and details. We also recommend you to read our buyers guide where we have discussed how to choose the best omnidirectional TV antenna. 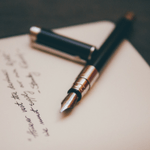 The points listed in the buyer’s guide would help you make the right choice. 1byone is a global leader in manufacturing TV accessories. This new concept TV antenna is indeed one omnidirectional antenna as it receives signals from all the directions, works 360 degrees. There is no need for you to change the directions of the antenna now with the help of any remote controllers. This TV antenna is capable of grasping signals from all the possible directions without any help. Overall it is certainly one of the best outdoor TV antennas. This omnidirectional TV antenna also looks splendid, is compact and has got a beautiful white finish which makes it look clean. Setting it up is also easy as the accessories which are needed are already provided with the pack. It has a very neat structure with a compact size. It has an anti-UV coating. It has a true 360-degree reception so there is no need to rotate it time and again. It can be positioned very comfortably as all the accessories needed are already included with the package. It has many mounting options and takes up a negligible amount of space. The exquisite design of this TV antenna makes it stand out. Also, the white color makes the whole look a bit more systematic. This thing is straightforward to install, and it also comes with all the necessary accessories. This TV antenna is so compactly engineered that it can be placed anywhere, easily. It also has a UV coating which helps it tolerate the harshest of weather. It also has several mounting options. It can be mounted in the attic or on the roof or in the balcony. This is completely your choice. It receives signals from all the directions, so it is omnidirectional. It has 360-degree signal reception, so you do not have to change its direction with a remote time and again. 1byone has a very attentive customer service. Although this TV antenna receives signals from all the directions, it’s signal reception is a bit poor if compared to the others. ANTOP has been one of the leading companies in manufacturing TV antennas and selling it in the USA. This company is renowned for the production of indoor and outdoor HDTV antennas. Its lineup of products is also great and very promising. 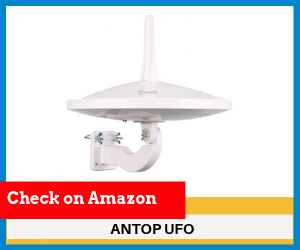 The ANTOP UFO TV antenna promises endless adjustment. It has 720-degree dual-omnidirectional signal reception. So there are no such cases where it faces signal blindness. This TV antenna comes with a sleek body and a glossy finish that makes it fascinating. The TV antenna is not too bulky and is light in weight. It works on dual omnidirectional signal reception as it is capable of receiving signals from 720-degrees. It has a really decent structure and is very easy to install. It has a built-in 4G LTE filter that protects it against signal interference and easily blocks all unwanted signals. It comes with ANTOP exclusive smart pass technology, the amplifier helps in balancing between short and long reception and a switch that helps in avoiding signal overload. It has a pretty durable exterior which is UV coated, that makes it weather resistant. It is the only true 720 degrees dual omnidirectional TV antenna on this list. This makes it elite and much better at receiving signals than the other standard TV antennas. The framework of this TV antenna is decent and requires almost no room for installation. Installing this TV antenna is really easy and requires very less effort. The built-in 4G LTE filter blocks unnecessary 3G and 4G wireless signals so that you all can enjoy clear and slick HDTV experience. Build quality could be improved. TERK is a significant manufacturer of indoor and outdoor signal receptors. 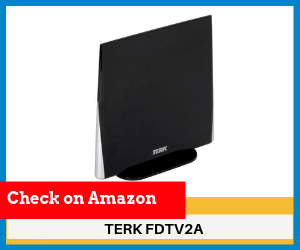 The TERK FDTV2A TV antenna is a flat indoor HDTV antenna, and it provides full HD 1080p quality. This is a 360 degree omnidirectional TV antenna and is specially blueprinted to complement the flat panel TVs in homes. The black finish and the sleek design also looks marvelous. The price of this TV antenna is the cherry on the cake. 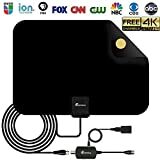 This TV antenna is available at such a reasonable price that it is hard to miss if you are searching for a good and decently priced TV antenna. It has a 360-degree omnidirectional signal reception. The extremely low noise amplifier supplies remarkable signal reception without dampening the signal. This TV antenna is easy to place anywhere. You can just lay it flat or mount it anywhere with the included mounting stand. It supports up to 1080i HDTV broadcasts for delivering good sound and picture quality. It supports 360-degree omnidirectional signal reception. So, it receives the signal from almost all the directions. A 6-foot coaxial cable is already provided with the package which is a good thing to have, and not all brands provide this. This TV antenna is so easy to handle that it can be carried anywhere around the house and can also be mounted anywhere all over the place. This TV antenna complements the looks of your flat TV as it is black and also flat and sleek. The pricing is honest. You won’t get a better deal in this price segment. The signal reception of this TV antenna is not as good as you would expect it to be. 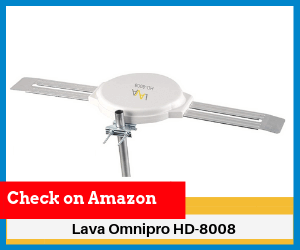 The Lava Omnipro HD-8008 HDTV antenna one of the best TV antennas out there in the market. The signal reception from over long distances is commendable. There is no need of rotating this TV antenna as it receives signals from all the directions. In short, it is a perfect 100 mile omnidirectional tv antenna (though it’s actual range is nearly 150 miles). This TV antenna may prove to be a bit hefty and not so portable and easy to handle but once installed, it surely amazes us by showing outstanding results. The signals received are strong and stable. The build would not stupefy you much as it is large and has an irregularly odd shape. The pricing of this TV antenna is excellent and the customer service provided afterward is also praiseworthy. It is a multidirectional HDTV antenna. It has 360-degree signal reception so no need of rotating it. It has an anti-UV coating and an anti-snow buildup quality. It works for 120 miles, well at least on paper. It is easy to install as it is light in weight and assembling it is an easy job. The multidirectional 360-degree signal reception is a good feature. The anti-UV coating, the anti-snow buildup characteristic and the fully waterproof guarantee by Lava for this TV antenna are splendid. This makes it endurable against severe weather conditions. The lightweight of this TV antenna makes it easy to install it anywhere outside the house or an RV. The long-distance signal reception on this TV antenna is exemplary. The build of this TV antenna does not look so amazing. The shape is a bit unusual and odd. This TV antenna is one of its kind. This is the thinnest and the most portable TV antenna you will ever find. This TV antenna is as thin as paper. This is one of the most innovative pieces of technology that you can find. It can also be reversed and painted upon to fit with the rest of the decor. The boundaries of using it are innumerable. 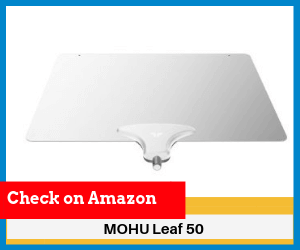 The MOHU Leaf 50 comes with a 16-foot cable, a 15 dB gain antenna amplifier and also an antenna amplifier with CleanPeak filtering technology. It can reach up to a 60-mile radius. It is amplified with the CleanPeak filter technology. There is a 16-foot detachable cable included with the bundle. It has an award-winning design with performance. It is paper-thin and is also reversible. It can easily be painted so that it fits in with the rest of the decor. It is multidirectional so there is no pointing needed. The CleanPeak technology really helps in tugging a clearer picture and more channels which further improves the overall viewing experience. The detachable cable provided adds up to the purchase value. The ground-breaking build of this TV antenna is truly special and this body makes it portable and easy to handle. This TV antenna works even if you reverse it so this makes it really convenient to use. This TV antenna can be painted according to the place it is going to be kept and also to match the interiors of the house. It is so light in weight that there would be no problem in installing it. The performance of this TV antenna is not as good as it should be. It is a bit of a hit or miss situation when you use it. 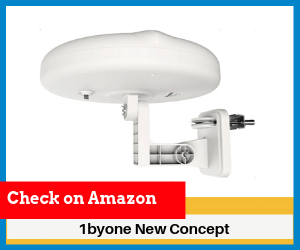 Another excellent TV antenna made by 1byone, but this time it is an indoor TV antenna. It has a fantastic signal receiving a range of 65 miles. It has a wood grain design that easily fits in with the decor of your home. The installation is also really easy as proper equipment and accessories are provided with this. A 19.7-foot long cable is provided with the bundle which makes things a tad easier. Long cable means that there would be no problem in stretching it over long distances or mounting it on a wall. 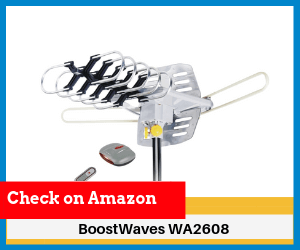 The maximum signal receiving range is 65 miles for this TV antenna. The number of channels that can be received by this TV antenna can be maximized with the help of two switchable amplifier modes. It has a quite simple wood grain design that goes well with the home decor. The installation of this TV antenna is easy. A very long 19.7-foot cable is also provided with this TV antenna which further helps in making installation easier. The two switchable amplifier modes make things easy for you as the number of channels can be easily maximized through this. The simple yet beautiful wood textured design makes it attractive and it becomes easy for you to mount it anywhere in your home. There is no need for worrying about the cable length as the cable provided is very long and is pretty satisfactory for the use. The TV antenna is so portable and easy to handle that it can be installed with the blink of an eye. The maximum signal receiving range is also appreciable. 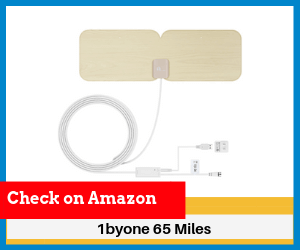 It is marketed as a 65-mile range TV antenna but it does not live up to the standards. The 65-mile signal range just looks good on paper but you would not get the same results. This Vansky HDTV antenna is super thin and will perfectly meet all your needs. This TV antenna delivers pretty satisfactory performance, and you would not have any significant issues with this. 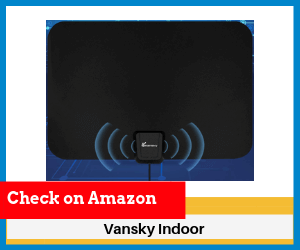 Though you all must not have heard anything about Vansky, this TV antenna by Vansky is definitely worth grabbing. Also, Vansky provides a 24/7 technical support and a lifetime guarantee with this TV antenna. Seeing the price of this TV antenna, the quality provided is amazing. You can get close to 150 channels with its help. This TV antenna does not have a stand but it can comfortably be mounted upon any wall of your home. This TV antenna receives over-the-air channels within an 80-mile range with the support of the signal amplifier. It comes with a 16.5-foot coaxial cable that helps the TV antenna to be mounted anywhere in the premises where the signal is the strongest. It has a detachable signal amplifier that increases the signal reception range. Vansky provides a 24/7 technical support. A 45-day money back assurance and a lifetime guarantee is also provided. The 60 mile to 80-mile signal range promised by Vansky for this TV antenna sounds great and if you place it well then it may give the desired results. The detachable amplifier signal booster is very convenient to use and works well. The consistent technical support provided and the lifetime guarantee are both commendable. The build of this TV antenna is great. It is thin and sleek and is black in color which gives it a classy look. Installing this TV antenna is really very easy as tapes are provided with it and also it is light in weight so mounting it would be easy. Overall, the performance provided with the low price is highly satisfactory. 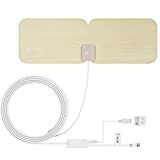 This TV antenna is a little less durable and the mounting tapes are not as sticky as they should be so you will have to mount it carefully with some other tape. 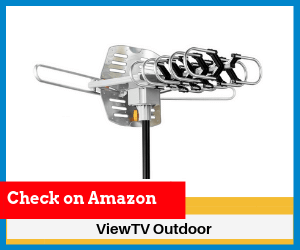 This ViewTV antenna is a rugged outdoor TV antenna. The structure of this TV antenna is a bit weird if we compare it to the others on this list. This TV antenna is not like the other portable antennas, it is a bit heavier and unportable. This TV antenna has built-in motor mechanics which makes it omnidirectional. The motor rotates the TV antenna according to the signals and notably in both the directions. Assembling this antenna may be a bit tougher job than the other smaller antennas. But, this TV antenna is quite durable and would easily withstand the harsh weather. This TV antenna has a 150-mile signal reception range. This TV antenna has dual TV outputs. It supports two televisions at the same time. This TV antenna is lightning protected so there should be no issue in mounting it outdoor. You will get a 40-foot coaxial cable with the package, so length should not be a problem. You get a one year guarantee with this TV antenna. The signal reception range promised by this TV antenna is greater than the other standard TV antennas. The dual TV output support is marvelous. Not many TV antennas have this feature. The extra long 40-foot coaxial cable makes mounting this TV antenna very easy. The lightning protection provided by ViewTV for this TV antenna is a much need feature. This is an all-rounder TV antenna for this price segment. There is no stand available with the package so you will have to buy one. Installing this TV antenna can be a pretty laborious job. 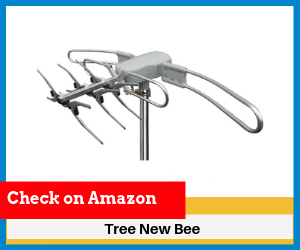 The Tree New Bee TV antenna offers direct competition to the ViewTV TV antenna. 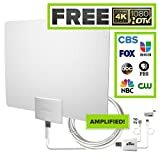 Most of the features and even the pricing of both these TV antennas are similar. This TV antenna comes with Tree New Bee’s pure vertex technology that directly omits FM signals and signals from other appliances. This TV antenna is omnidirectional as this also comes with motorized rotation, so now there is no need to change its direction by climbing up on the roof. This TV antenna is omnidirectional and rotates 360 degrees with the help of motor mechanics. A 40-foot long coaxial cable is provided with the bundle. This TV antenna has dual TV outputs. It has a sturdy structure and would not get damaged easily. The motor mechanics work perfectly fine and the antenna rotates flawlessly. The 150-mile signal reception range should be more than enough for an average user. The coaxial cable is long enough for mounting this TV antenna easily. The dual TV support is a good thing to have if you have two TV’s in your home. The build quality of this TV antenna is impeccable. It has a pretty unusual build if we compare it to the others and this TVC antenna is also large in size so handling and mounting it can a bit of a difficulty. 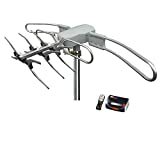 This is a high performing TV antenna and offers maximum features for its given price. This TV antenna is somewhat similar to the TV antennas mentioned before, like the Tree New Bee Outdoor TV antenna and the ViewTV Outdoor TV antenna. Its signal reception range is up to 125 miles which we guess is justified for this price. Also, this TV antenna is omnidirectional as it rotates 360 degrees for reception of signals. The design of this TV antenna may look a bit absurd, but the build quality is solid. It has waterproof capabilities too so there should be no problems during rain. It has a motor mechanism which makes this TV antenna truly omnidirectional. It rotates 360 degrees to receive signal. It has a very durable outdoor connection. A 50-foot coaxial cable is provided with the whole bundle. This TV antenna has dual TV outputs so that you can connect two TVs with this TV antenna at the same time. The body is waterproof so there should be no disturbance while a drizzle. This omnidirectional TV antenna has rotation capabilities which help it in receiving signals easily. It rotates 360 degrees. The 50-foot coaxial cable adds up to the value of the purchase. This TV antenna is capable of being attached to two TVs simultaneously. The body is quite firm and also waterproof which makes it capable of withstanding rain. The pricing is honest and you get maximum features for the price you have paid. The motor goes only one way so rotating this TV antenna is a bit tough and irritating sometimes. The whole process of rotating it, again and again, takes up more time and becomes tiresome. Antop is indeed a gamechanger when it comes to omnidirectional TV antennas. This antenna performs, and you would hardly face any signal blindness. 1) Frequency: Over-the-air (OTA) TV channels have a designated radio frequency. 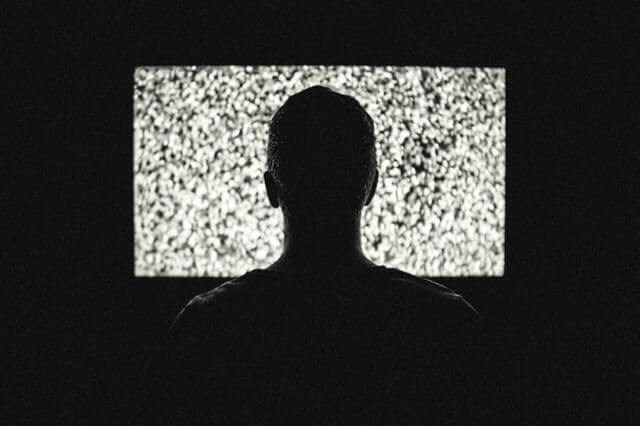 For watching a particular channel falling in the specific frequency band, you would want the TV Antenna to work at that specific radio frequency. 2) Noise: Higher the Noise Margin (NM), stronger the signal is. The Noise Margin is depicted in decibels (dB) in the antenna specifications. 3) Range/Distance: It tells you the capability of the TV antenna to catch a signal/frequency of a channel within the mentioned range. For eg, An antenna having a range of 100 miles states that it can only catch the radio frequency of channels within a 100-mile range. In short, you would be able to watch only those TV channels whose transmitter falls in the 100-mile range from where the antenna. Though, factors like trees and air density also obstruct and narrows the actual range in various cases. Though you can set up an antenna indoors as well, it is suggested that you use an outdoor antenna for different reasons. 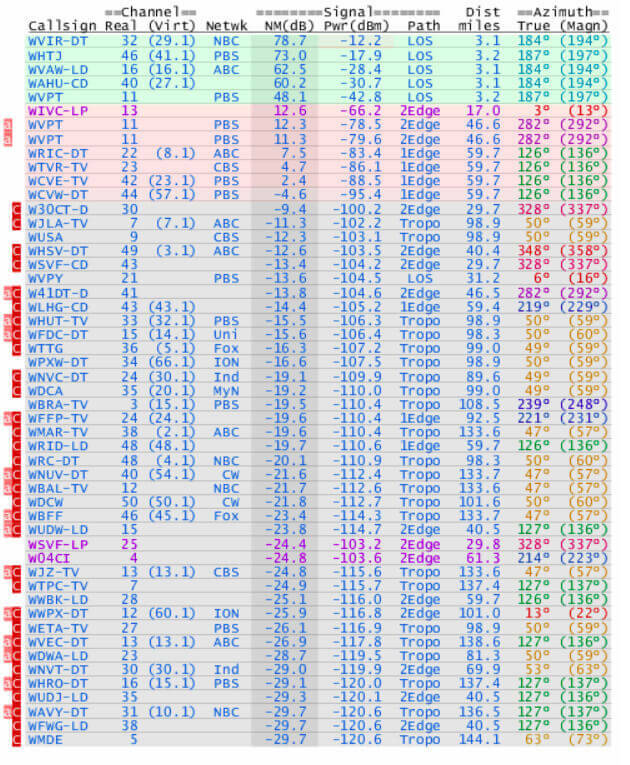 In the above image, you can see that the rows are color coded. Using these color codes, you can determine whether to go for an indoor or an outdoor TV antenna. The crux is, do not solely go out and buy an antenna which has the longest range. Instead, check the color codes and understand which all channels you want to watch and then choose the particular TV antenna. We hope that now you must have got great insights on how to choose the best omnidirectional TV antenna for your home. Do check the product details thoroughly before buying a particular antenna. Do let us in the comments section below if you still have any doubts regarding buying your next TV antenna. We would be happy to help you.